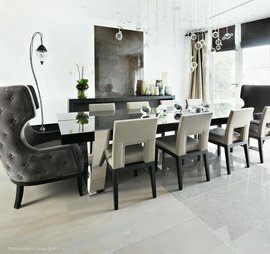 Ampersand Interiors offer full interior design service packages from rental to permanent living. We offer a consultation service to help our customers achieve their design aspirations and support with technical issues that will work in the extreme weather conditions here in Cyprus. Ampersand has a reputation for being one of the best curtain and blind suppliers in Paphos. We provide the highest of quality curtains and blinds to fit any kind of window / door opening. Our collections are vast and priced to suit middle to high-end window and soft furnishing solutions and we can supply a large choice of curtain poles and accessories. Matching cushions and bed dressings can be made to complete the design of any room. We also have a huge choice of upholstery fabrics and sun resistant garden cushion textiles. Come see our wide selection of fans - we can deliver and fit them in your own home. Window dressings, sun awnings, interior furnishings and accessories.